Educated at the London School of Economics, Bryan remained at the LSE as an Assistant Lecturer in Geography. When the Leicester University College opened in 1921 a local grammar school teacher, Miss Gladys Sarson, was appointed as to teach geography on a part-time basis. In 1922 the College decided to start appointing a small number of full-time Lecturers, and “Pat” Bryan was appointed to teach geography with the continuing assistance of Miss Sarson, and in the same year he joined the Lit. and Phil. Within the University he soon also took on responsibility for Commerce – the origins of Leicester University’s Economic Departments. For 32 years Geography at Leicester was synonymous with Pat Bryan. Besides being Head of Department, he was Vice-Principal for over twenty years and Chairman of numerous College Boards. Even so, he found time to make important scholarly contributions. In 1924 he was one of the first students to be awarded by London University the – for Britain – new degree of Doctor of Philosophy with a thesis published later the same year as part of a book, North America, written with L L Rodwell Jones, which remained in print until 1968. This was followed in 1933 by Man’s Adaptation of Nature: Studies in Cultural Landscape, a magnum opus which was conceptually far ahead of its time, and his Presidential Address to the Lit. and Phil. returned to the same theme in his analysis of the Leicestershire landscape. These early years were ones of intense struggle, with Bryan and Sarson teaching the entire syllabus. Between 1926 and 1939 only fifteen students graduated in Geography, the first being Walter Baker in 1926. Accommodation was limited to a lecture room and a practical room which contained some surveying equipment and a few maps. 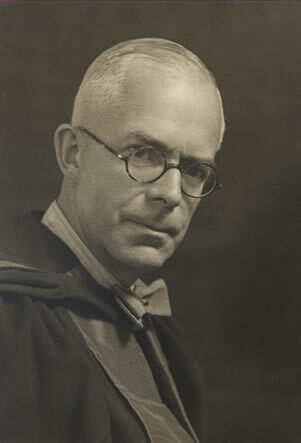 With the recognition of the University College by the UGC in 1946 new staff and resources became available, including the first Departmental Technician. By the time of Bryan’s retirement in 1954 with the title of Professor and Head of Department of Geography, four new Geography Lecturer posts had been established, and all four of Bryan’s new recruits were to make significant contributions to geography. He remained in Leicester in his retirement to his death at the age of 82. Reference: 75 years of Geography University of Leicester Bulletin May 1997. Presidential Address: The Landscape of Leicestershire. Transactions of Leicester Literary and Philosophical Society vol. 39, 1938, pp. 5 – 16.